He really is so dang cute!!! I will sure look forward to hearing the snow fall in your neck of the woods. ha! You could be magnanimous and make snow ice-creme with any snow. But you don't have to tell him that and surprise him. I promise I will not say who I'm rooting for !!!! I hope you get a dusting, but too much snow would make it hard to get around. Well I just dislike the white stuff big time, buttttt... since it would be at your house and not mine LOL I hope Pierce gets his snow ice cream dinner. Well I am just sayin, I mean how can you not hope for that for him with that cute little face. LOL.... what a cute post Lisa and Pierce is adoreable. I am going to sit on the fence on this one and wait and see what happens. oh my, he really is sooo cute!!! this made me laugh! good luck! We haven't got a single FLAKE on the ground and we bought the boys snowshoes for Christmas--so guess how I'm leaning. Well, since I love snow, I am hoping that your son is correct... However, I think you are going to be right this winter.. Our predictions here are for a MILD winter --and wet... So far, December has been the wettest in many years. We are snow free in North Dakota but I'd love to see you get 12" of snow...only because snow ice creams sounds so yummy! (Okay, I tried commenting earlier, but I was having some computer issues, so here I am again). I can't wait to see who wins this bet!! Oh I coud bet my five year old that in SoCal. :). Here's hoping for you. I'm rooting for Pierce, but you will probably win the bet. Here it is the week before Christmas, and it was almost 70 degrees today. No snow yet here but we are expecting a few inches on Christmas! 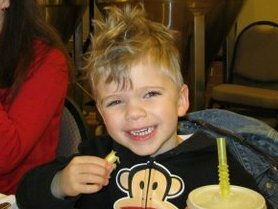 He is so darn cute- I LOVE his hair! Hi Lisa, thanks for stopping by my blog. Why is it that five year olds are just so darn cute! You KNOW I am rooting for the cute 5 year old. I will keep my fingers and toes crossed for a blizzard! Next you will need to teach him how to say, "I told you so! Na Na Na Boo Boo!" Definitely rooting for your sweet guy!